Spring is almost here and I’m dreaming of soft sunlight and crisp, cool air. 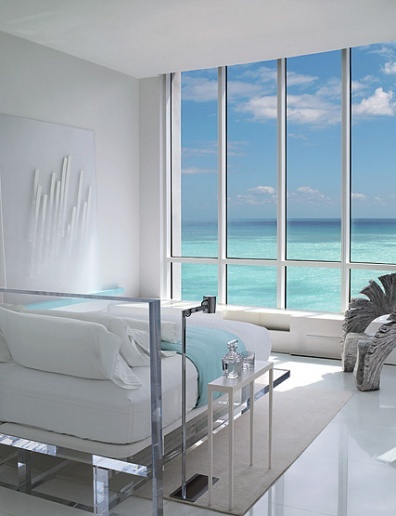 In honor of Spring’s arrival, I wanted to showcase one of my favorite interior designers, Jennifer Post, whose work in this Miami Beach high-rise brilliantly evokes a breath of fresh air. It was maddening love at first sight as I flipped through an issue of Architectural Digest (I’m obsessed!) where her work was featured. I’m passionate about design, but rarely do I come across a designer whose signature style calls so closely to my heart. Can you believe that view? 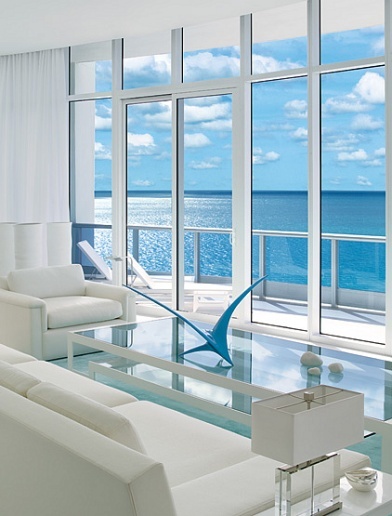 Forget about coffee table books and conversation pieces, the stunning view itself is a conversational statement. Post brings elements of the external environment inside through touches of color. I like the big sculpture, which actually makes the space seem larger because of its grand size. The floor to ceiling windows are my favorite element in this room — actually it’s a favorite of mine in any space. Beautiful, natural light to me is true luxury. I love those silver “water droplets” on the dining table — a really subtle, clean accent without being cheesy. With such a pure palette, I can imagine the food and festivities taking center stage. Shiny silver and sparkling glass with an all-white palette make this space pristine. 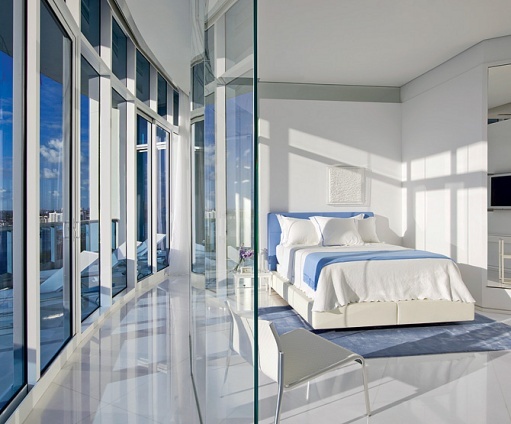 In this bedroom, Post wanted to avoid enclosing what would otherwise be a fantastic light-filled space, so she opted for glass walls. Like the rest of the house, oceanic blues, soothing turquoise and soft cloud-whites are weaved into the interior, creating the feeling of a seamless transition between the environment outside and the spaces inside. The clean lines, lucite and glass surfaces and white palette take full advantage of the natural light by giving it as many opportunities to sparkle and reflect as possible. 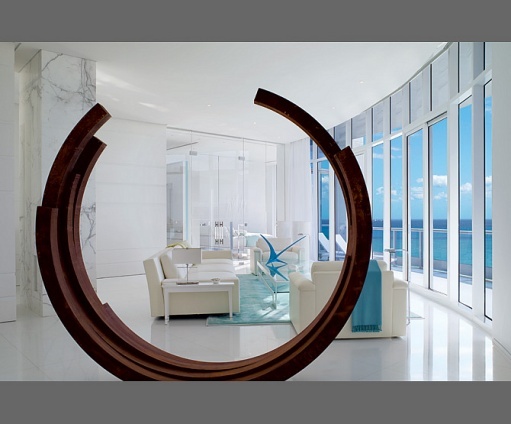 The end result is an elegant pure space that radiates serious visual appeal.